Congratulations on the procurement your new INFJ! * INFJs are highly sought after in the personality type collecting world given their extremely rare nature. 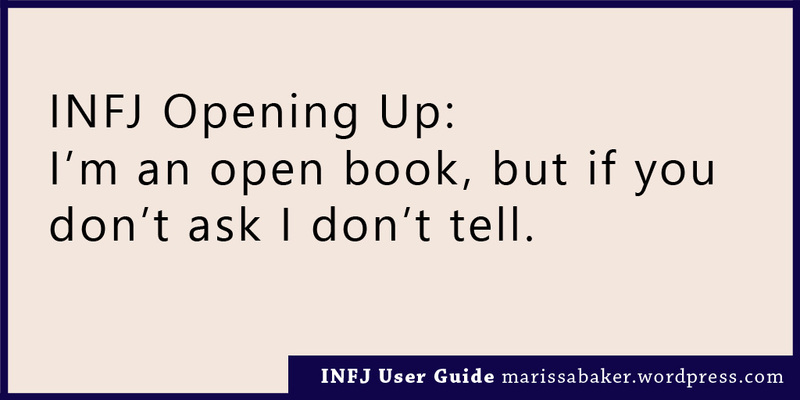 INFJ spotting is a very difficult hobby, requiring forays into the deepest recesses of bookstores, yoga studios, and the internet. Keeping an INFJ in your life once you’ve found one can be even more of a challenge. INFJs are widely considered one of the most amiable and empathetic personalities. Their minds offer a good balance of emotion and logic that helps them relate to most types of people, and they highly value commitment and relationships. As introverts, though, they have limited social energy and they don’t maintain relationships with most of the people they meet. Once you’ve found an INFJ, taking your acquaintance to the level or friendship, or relationship, isn’t simple. That is, unless you have this user guide. The INFJ is a strange sort of creature, often compared to unicorns. Their uniqueness is a result of two things: the way their brains/personalities are hardwired and the rarity of their personality type. What’s perfectly normal for an INFJ seems unusual among humanity as a whole because so few people function this way. Understanding your INFJ’s basic functions is the first step towards successful interaction with the INFJ. Introverted Intuition — advanced pattern recognition software used to connect seemingly unrelated bits of information to get at the “big picture.” Sees multiple sides to every situation and often includes complex daydreams, multiple inner worlds, conversations that never happened, and plans to unite humanity. Extroverted Feeling — a.k.a the emotional sponge. Picks up on other people’s feelings, emotions, and needs. Empathizes on every level, mirrors others to fit-in and meet them where they are, tries to meet needs without being asked. Not so good at handling the INFJ’s own emotions. Introverted Thinking — strategy and logic center. Not as well developed as the feelings side, but often used in connection with Introverted Intuition to make sense of patterns and ideas, as well as formulate plans. May trap the INFJ in an introverted loop where they overthink everything and never reach a decision. Extroverted Sensing — the part of an INFJ that deals with external, sensory information. Rarely works properly. Responsible for the phenomenon that makes INFJs appear graceful one minute then literally trip over their own feet the next. May result in healthy functions such as cooking and gardening, or unhealthy processes such as binge shopping and consuming excessive amounts of pastries. Chameleon — blends in with the people around them and adapts to any social situation, as if they’re trying on different personalities like masks. The chameleon INFJ may be mistaken for an extrovert. Guru — in-touch with their spirituality and on a quest for personal enlightenment. More than happy to help you toward enlightenment as well. Manipulator — uses their powers of understanding people for their own benefit. Many INFJs do this in moderation, but it can show up excessively in an unhealthy INFJ. Revolutionary — wants to change the world. Typically peaceful (INFJs hate conflict), but may become more forceful if sufficiently provoked and/or disillusioned. Scholar — obsessed with one or more academic fields. Can show up as a hobby or full-time profession. Personal book collection may rival a public library. INFJs typically appear quiet yet friendly upon first acquaintance. Like most other introverts, they dislike small-talk, but they can fake it for a while. 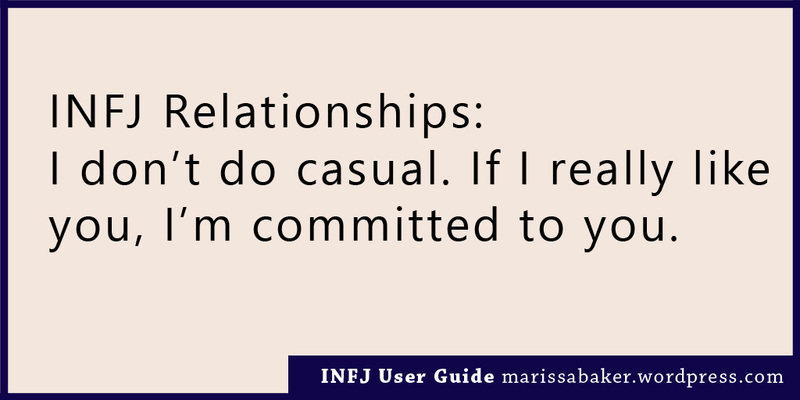 If you want to have a casual chat about every day subjects, the INFJ will react politely until the conversation ends and then leave, most likely without revealing anything about themselves that they consider important (including the fact that they’re an INFJ). At first, you’ll probably be the one initiating conversations with your new INFJ friend. Once they know you really are interested in talking with them (and if they’re interested in talking with you), they’ll start to open up and make the effort to keep in contact. 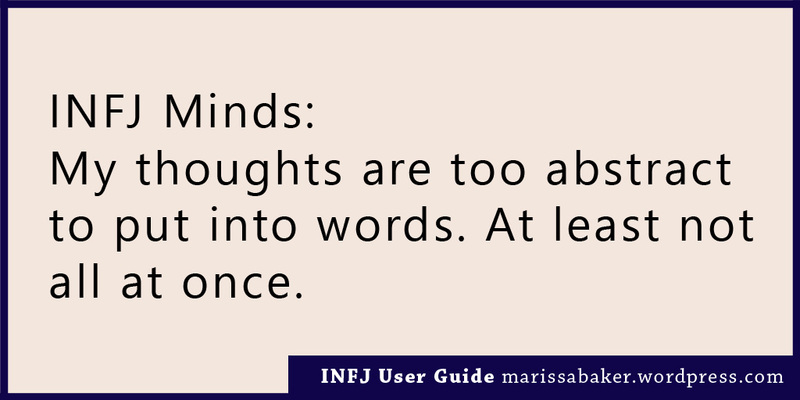 Keep in mind that understanding is one of the most important things to an INFJ. If they feel like you “get” and accept them, they’ll be more likely to let you get close. INFJs sort people into different friendship levels (see this post I write for Jennifer Soldner’s blog). Remember, your INFJ has a limited amount of social energy and they’re only going to spend it on the people who need them the most and/or the ones they care most about (ideally you’re in the latter category). Advanced users who’ve become friends with the INFJ (at least one step-up from acquaintance) will see new sides to the INFJ personality. Deep Thinker — this is one of the quickest ways to level-up your friendship with an INFJ. Once they know you’re comfortable diving deep into discussions, they’re more likely to share their own views. Unlock this mode by being careful not to vilify arguments that you don’t agree with — INFJs don’t mind respectful disagreement, but they hate conflict and won’t open up if they think you’d feel threatened by their honest ideas. Playful — a relaxed INFJ in the company of people they’re comfortable with is the exact opposite of up-tight and quiet. You might be surprised how off-beat their sense of humor is and how open they are to new and exciting experiences. Passionate defender — INFJs often feel very strongly that they want to make things right in the world. While they’ll talk about their chosen battles with anyone given the right context, having a friend who’s interesting in the same things and/or supports their passion is huge. Also, they’ll defend you if the need arises. Romantic — INFJs tend to prefer committed monogamy in romantic relationships. They’re highly unlikely to date casually and are searching for someone they can connect with on a soul-mate level. Click here to read about 15 things you should know if you want to date an INFJ..
INFJs are not unbreakable or more resilient than other people. In fact, they tend to be more sensitive (many are HSPs as well as INFJs). 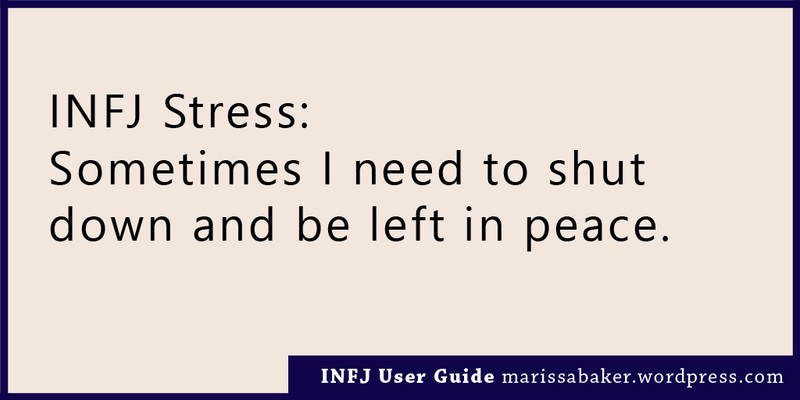 Sooner or later, something is going to trigger a stress reaction in your INFJ. Anxiety — many INFJs deal with anxiety of one form or another, often related to over-thinking. Try talking with your INFJ about what triggers their anxiety and finding out if there’s anything you can do to help. In many cases, just knowing you care without judging them is a huge relief. Obsession — stressed-out INFJs may respond by becoming obsessed with controlling the details of their environment. Don’t bother trying to convince them (at least right away) that they’re being illogical. Instead, encourage them to get out in nature, exercise, read a book, see a movie — something to break the cycle inside their head. Overload — too much intensity from other people can overload an INFJ’s extroverted feeling. They need space and alone time to re-charge. Withdrawal — while INFJs need a certain amount of alone-time, complete withdrawal from the world for long periods of time is not normal or healthy. This type is prone to depression, and in some cases need professional help to overcome and/or live with that condition. INFJs are highly unlikely to let you know they want support, but make sure to offer empathy, understanding, and affirmation. There is a limit to how much you can get an INFJ to let you in. No matter how much you want a relationship with an INFJ, the INFJ also has to want a relationship with you for things to work out (either on a close friends level or in a romance). They won’t force their friendship on other people and they don’t like to feel you’re being pushy either. What INFJs need most is to feel understood and accepted for who they are. They don’t like it when you assume you know them after only a few days, weeks, months, or even (in some cases) years of acquaintance. They want to feel safe talking with you about anything, and they want to make you feel like you can tell them anything as well. INFJs don’t like one-sided friendships in either direction. Q: My INFJ door-slammed me! Is there anything I can do? A: Probably not. 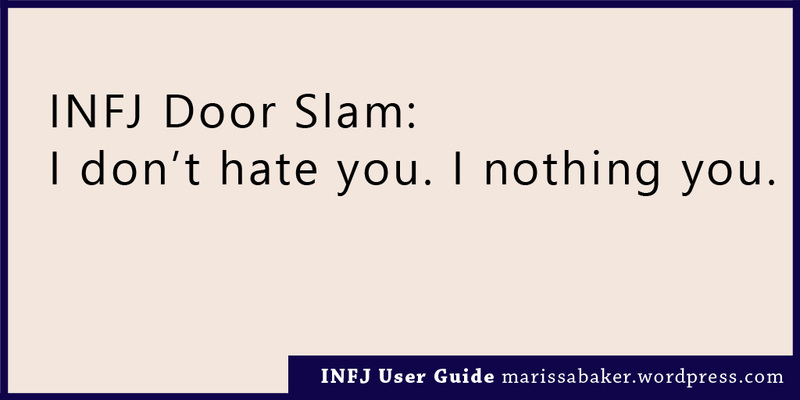 INFJs don’t door-slam unless they’ve been deeply hurt. It’s a last-resort defense mechanism. If you really want to restore the relationship, let the INFJ know you want to get back into their life and then give them some space. Pestering the INFJ will only board-up the door more firmly. Q: What if I think my INFJ suffers from “special snowflake” syndrome? A: Many INFJs grow up feeling misunderstood and embrace the uniqueness of the INFJ label when they discover Myers-Briggs. If you attack their sense of individuality, the INFJ will react defensively (often by shutting you out of their life rather than direct confrontation). Let your INFJ know you understand that they feel rare, unusual, and out of place, but remember they may also need a reminder that they really are part of the human race. Healthy INFJs won’t insist that they are better than other people or push you away for reminding them that they’re human. Q: Why is my INFJ obsessed with Myers-Briggs types? Those four little letters mean so much to many INFJs because it means they’re not alone. It means they are not too sensitive, too quiet, too weird, too intense, or whatever other lies they picked up during their childhood. It’s permission to focus on being the best version of themselves instead of tying to fit in with other people. Q: Why is my INFJ unresponsive? (either staring off into space during conversation or not responding to calls/texts/emails/life). A: As stated before, an INFJ’s primary method of processing the world is introverted. It’s easy for them to get distracted from the world outside by the world that’s inside their heads. If they look “spaced out,” that usually means they’re thinking about something that is (at least momentarily) more interesting than what’s going on in the outside world. Please don’t poke or shout at the INFJ to get their attention — speaking to them or a light touch should be enough to bring them back. When an INFJ stops responding to communication attempts that don’t take place in person, there are several possible explanations. It could be similar to what’s going on when they get distracted by their inner worlds, in which case they should get back to you eventually. Or they might not think your comment needed a response. Or they might be sending the message that they don’t want to talk with you without actually saying that to your face. Or they could be struggling with a stress-reaction (see “Troubleshooting and Support”). Sometimes it’s hard to tell. Q: Does my INFJ agree with what I’m saying? This is a hard one. INFJs like to be agreeable (sometimes too agreeable) and tend to avoid conflict, so it’s not always easy to tell whether they’re just listening politely or actually agree with what you’re saying. See my post Your Not-At-All-Confusing Guide To Finding Out If An INFJ Agrees With You for more information. ← But What If God Scares Me? Interesting post! I do agree with the levels or categories of friendship which INFJs would classify people in. Sometimes I hurt people by refusing to acknowledge them as friends when they clearly consider me as one. Those who are closest to me though (the inner sanctum) surprisingly know if they are in danger of being “door-slammed”. My ISTP sister would confess later on that she felt like she was being tested (and she was) and that a wrong answer would mean me distancing myself forever. Doesn’t happen often but I recognize it’s unhealthy. 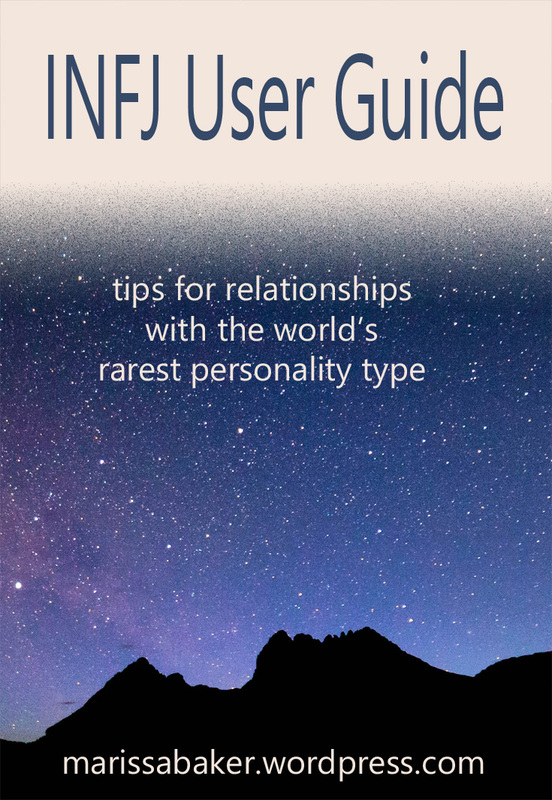 I think most of it is quite true, however I don’t think any INFJ would really appreciate to read the words ‘your INFJ’, ‘INFJ spotting’ or ‘personality type collecting world’. This stuff is not a game and although you mention you are trying to be entertaining, I can assure you this actually made me puke inside. No matter how keen you are to ‘own’ an INFJ, as you mentioned, you will never. 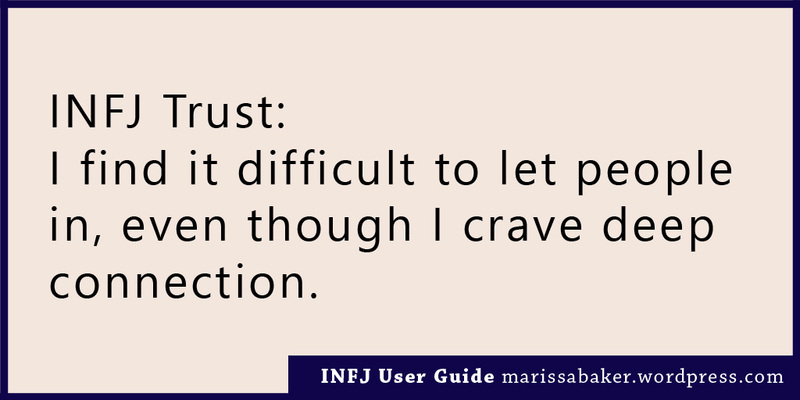 It’s up to the INFJ if they let you in. Don’t resort to manipulation or strategic thinking to get an INFJ to like you. If they do like you and want to hang out, it’s because you are a good person. Nothing less, nothing more. You can pin that button to your shirt then. Thanks for your comment, Mary. Honestly, I’m surprised that you’re the first person to bring this up. Most readers I’ve heard from enjoy the “user manual” format, but I also knew it wouldn’t resonate with everyone. 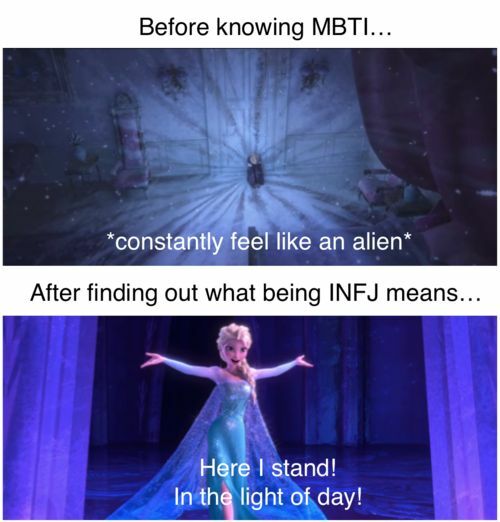 Thanks for this post, I newly found out about INFJs and I definitely felt like Elsa. Spot on with the “I nothing you”. I am known for cutting people out of mylife because I simply ‘Nothing them’. Great way to explain to someone!